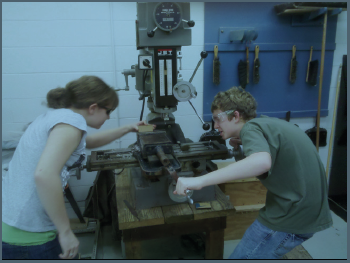 Machining classes are taking place at West High School for team 501 members. This class is on Wednesdays from 3:30 to 4:30pm. This class teaches the students that participate many different machining terms and how machining originated. It also teaches the students how to set up a cutting tool, how to operate each step, and other machining steps. For many students this class is helpful and useful, for when the big robot needs to be designed. For other students they just go to learn about what is involved in machining parts.